The big day has come and gone. Some big names and big-time talent changed sweaters Monday, Trade Deadline Day, as the push for the Stanley Cup Playoffs heats up. Here’s a look at some of the most notable Monday moves, including a Senators star who’s ready to help the Golden Knights in their quest to hoist hockey’s fabled silver cup. 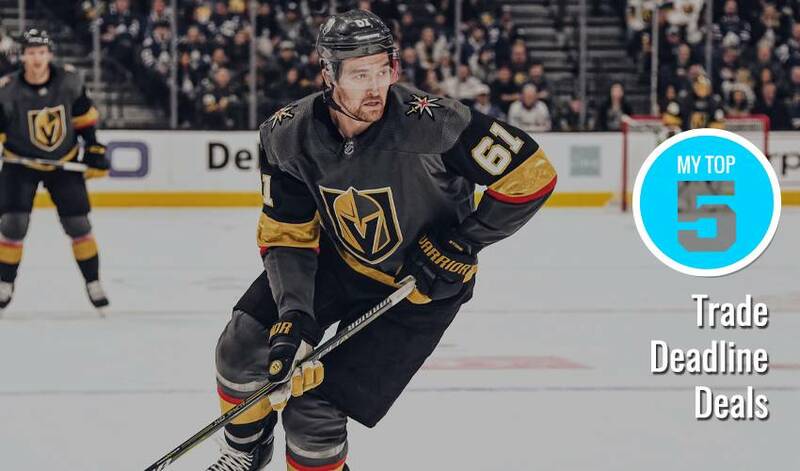 It was a good day for the Knights as they acquired Mark Stone from Ottawa, and then saw him agree to an eight-year deal with the club. The right wing is averaging slightly over a point per game this season, a campaign that includes 28 goals and a plus-13 rating. The 26-year-old, traded to Vegas with forward Tobias Lindberg for forward Oscar Lindberg, defenceman Erik Brannstrom and a second-round pick in 2020, has eight points in his past five games. Wayne Simmonds, aka, “Wayne Train,” makes the next stop of his career in Nashville, dealt to the Predators for Ryan Hartman and a conditional fourth-round pick in 2020. A four-time 20-goal scorer, who also has a pair of 30-goal campaigns, Simmonds has appeared in 824 NHL games, including 584 with the Flyers. He has 41 career game-winning goals. With 14 goals and 42 points in 51 games, Kevin Hayes brings some serious offensive skill to Winnipeg. The Massachusetts native was dealt from the Rangers to the Jets for Brendan Lemieux, a 2019 first-round pick and a conditional fourth-round pick in 2022. Last year, the 26-year-old Hayes lit the lamp a career-best 25 times. Western Conference clubs Minnesota and Nashville swapped forwards Mikael Granlund and Kevin Fiala. Granlund, now a member of the Predators, has 15 goals and 34 assists on the season, while the Swiss-born Fiala has 10 tallies and 22 helpers. The deal came one day before Granlund celebrated his 27th birthday. Columbus added strength, size and a Stanley Cup winner to its blue line when they acquired defenceman Adam McQuaid from the New York Rangers. The 32-year-old Prince Edward Island native has appeared in 68 post-season games, winning the championship with the Boston Bruins in 2011.